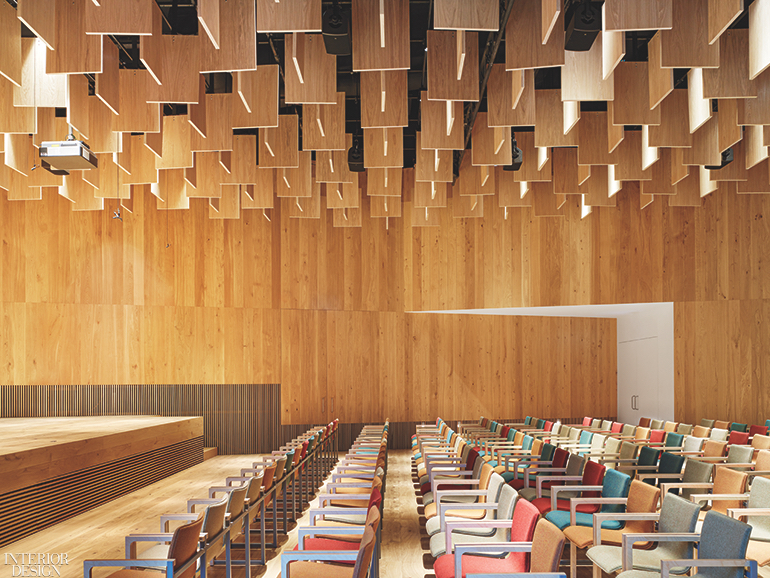 At the Arvo Pärt Centre in Laulasmaa, Estonia, by Nieto Sobejano Arquitectos, Miguel Ángel Ciganda chairs offset the performance auditorium’s custom oak-veneered paneling and ceiling diffusers. Photography by Roland Halbe. The clients are the 83-year-old composer and his wife, Nora, who live in a small cabin near the center. “They never asked us about this or that detail,” Sobejano recalls. “They trusted us and tried to understand our work as a whole.” In turn, the Nieto Sobejano Arquitectos team was “always playing Arvo’s music over and over. So much so that the cadence and rhythm would get into my body when I was designing,” he continues. Both Spiegel im Speigel and Tabula Rasa were heavily favored. 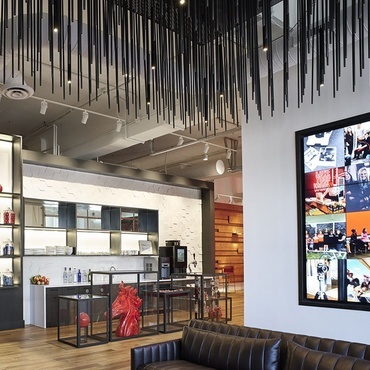 Unlike some of the firm’s other projects, this one had a hard completion deadline. The year 2018 marked the 100th anniversary of Estonia’s independence, and, since the composer is a national figure, the center was to be part of the celebration. 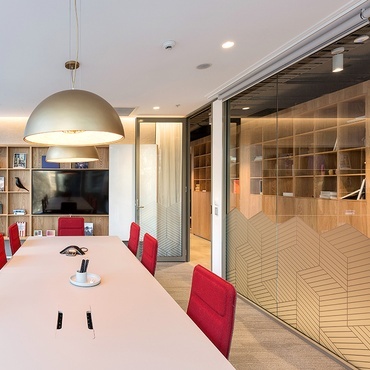 The architects faced several hiccups, partially because their work experience lies predominantly in Spain, where they are mostly based, and Germany. “Never in these Nordic countries,” Sobejano notes. Start to finish, construction took 1 1/2 years. Busk + Hertzog chairs line the triple-pane glass wall bordering the gallery. Photography by Roland Halbe. Pouring a slab of concrete for the building to float on was a critical primary move. “Because the site is close to the sea, the ground is sandy, so we couldn’t build on it,” Sobejano explains. 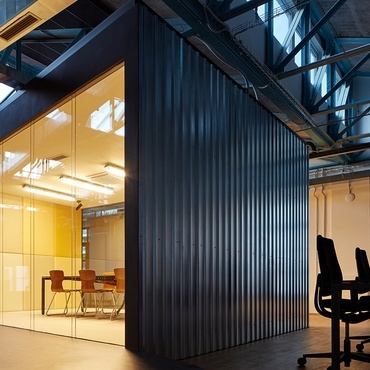 Considering the ratio of glass to metal also became essential because of the layers of thermal insulation needed to create a sustainable and easily heated structure. But first Nieto Sobejano decided what the project shouldn’t have. Outlawed elements included right angles, a main facade, and a discernable front or back. Instead, what emerged was a pattern of “continuous links echoing the trees,” Sobejano says. 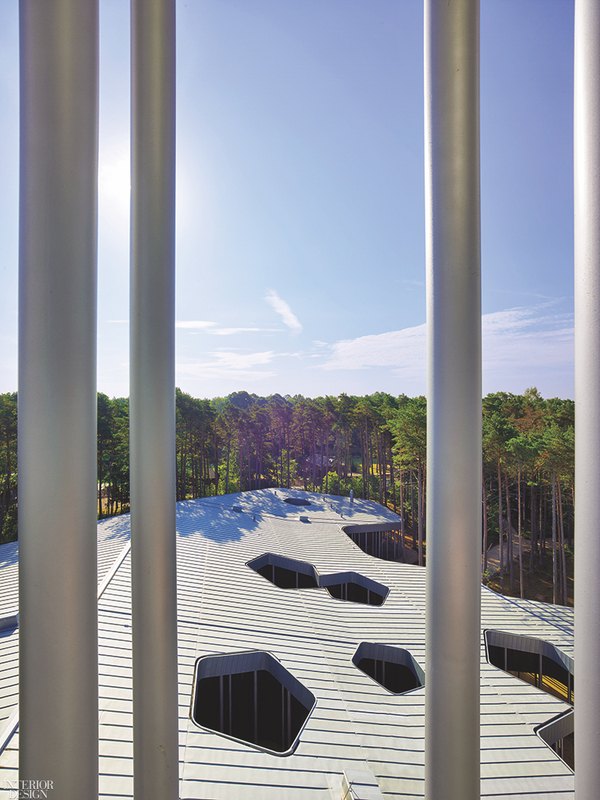 Gentle yet calculated, the center began with a system of slender, treelike steel columns outside that’s fronted by an undulating wall of glass, allowing constant connection to the landscape. The folded roof, originally conceived as aluminum but later changed to zinc for the climate, hosts a smattering of pentagonal cutouts. 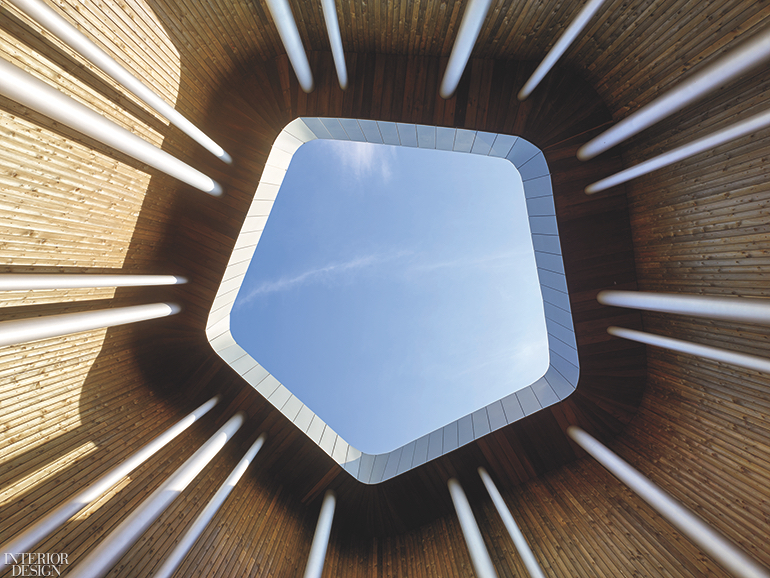 “This idea of associating music, landscape, and architecture became an expression of shape,” Sobejano states. The pentagon emerged as the obvious selection because it’s one of the most repeated forms in nature, namely in leaves and flowers. It also has a connection to pentagrama, the Spanish word for a musical notation. Plastic-laminate displays surround the gift shop. Photography by Roland Halbe. 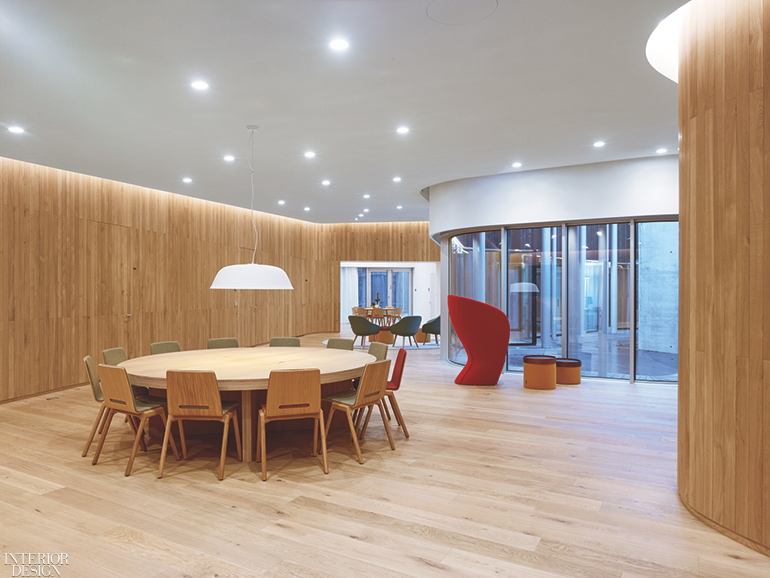 Prioritizing balance, the project employed only two types of wood: locally sourced Siberian birch for the exterior and white oak veneer on the interior. 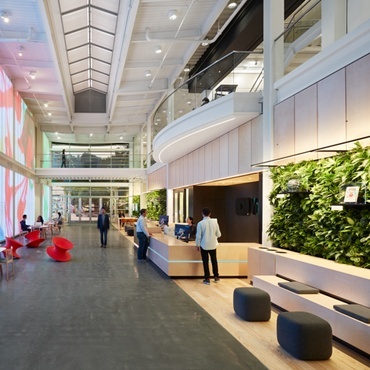 The warm oak allows for the public spaces—entry, café, library, gallery, and performance auditorium—to feel neither too weighty nor too expansive. 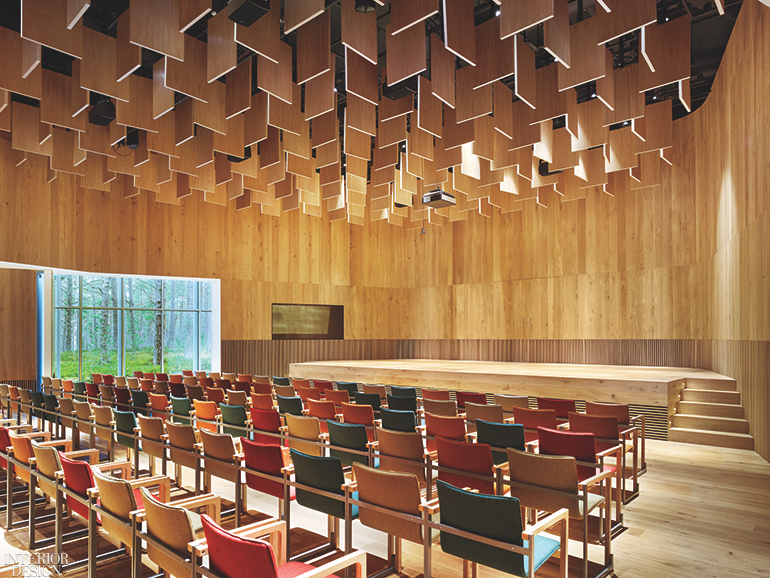 To achieve an acoustically superior auditorium, the firm collaborated with Higini Arau of Arau Acustica, and the result is a custom series of rectangular oak-veneered diffusers that hang from the ceiling. Their different heights and positions help modulate a variety of sounds. 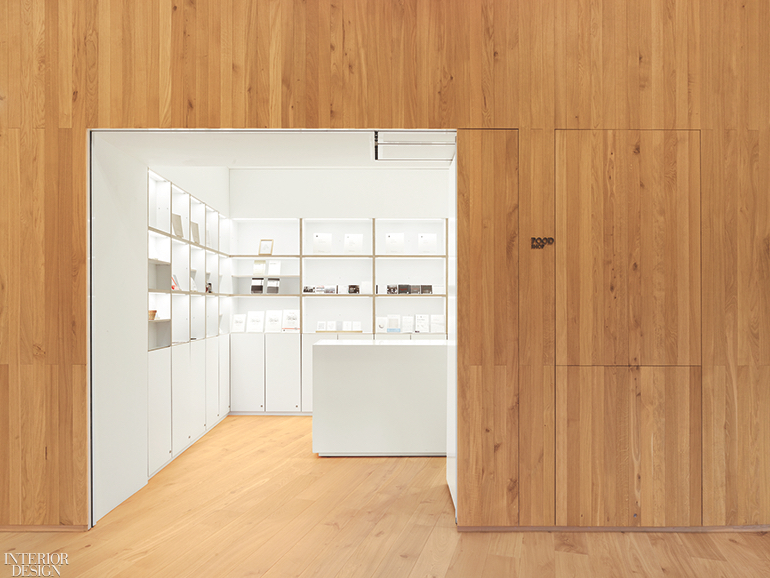 The singular break from oak arrives at the gift shop, where the color white coats walls and built-ins from floor to ceiling. “We like playing with contrast,” Sobejano says, “and with this element everything becomes a different color”—much like when the snow coats the forest in winter. 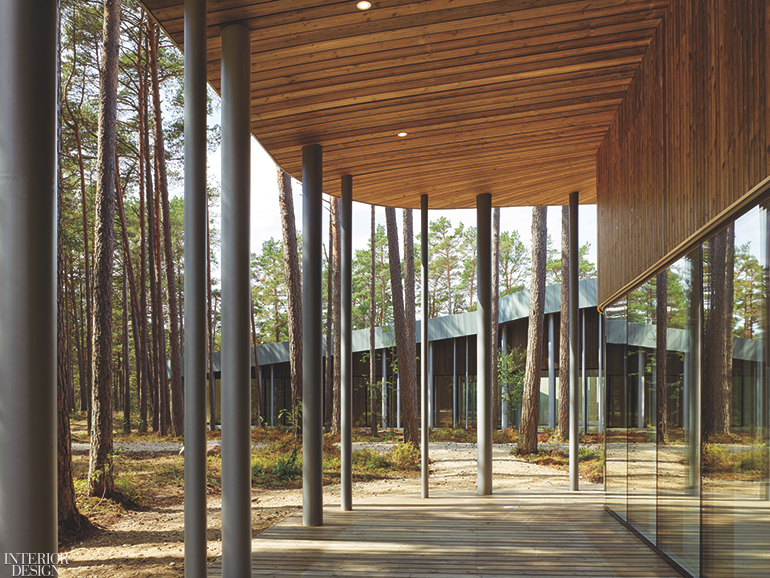 Echoing the shape and color of the surrounding pine trees, the breezeway off the café terrace combines steel columns capped by a Siberian birch overhang. Photography by Roland Halbe. Drawing inspiration from Estonia’s Scandinavian neighbors, the furniture is modern yet restrained. In the auditorium, the colors of the rows of Miguel Ángel Ciganda armchairs derive from those of the forest—from bark brown to mossy green—while sculptural Busk + Hertzog lounge chairs in the exhibition area provide crimson and tangerine notes. 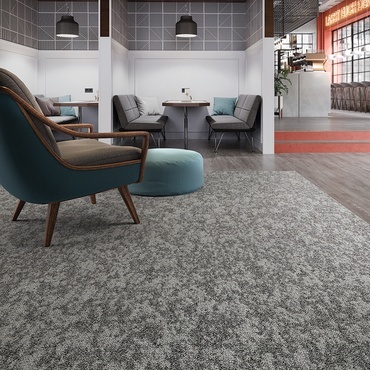 There is another departure from the project’s predominantly wooden palette. It appears in two separate structures that are part of the 9-acre site. 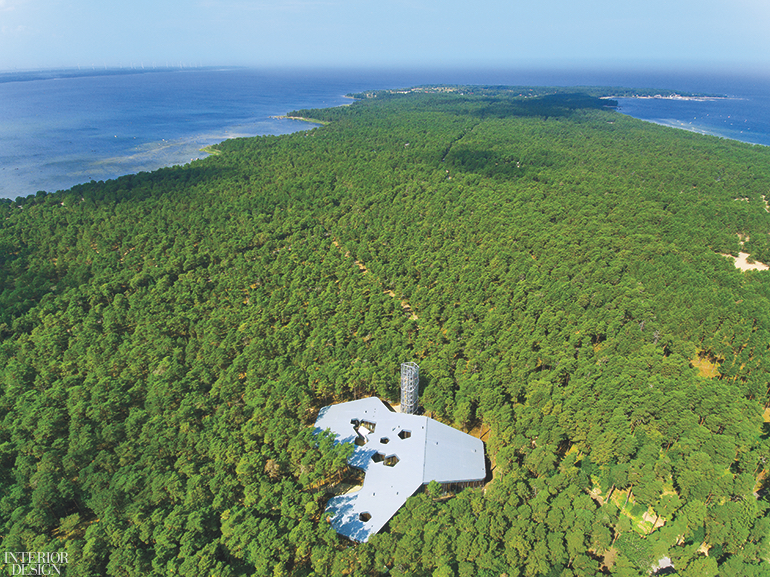 The buildings came at the request of the Pärts: a viewing tower and a private chapel. To guide Nieto Sobejano for the latter, the couple shared a photograph of a small church they discovered while traveling in Greece. The result here is a stark concrete edifice that’s situated in a courtyard within the main building. 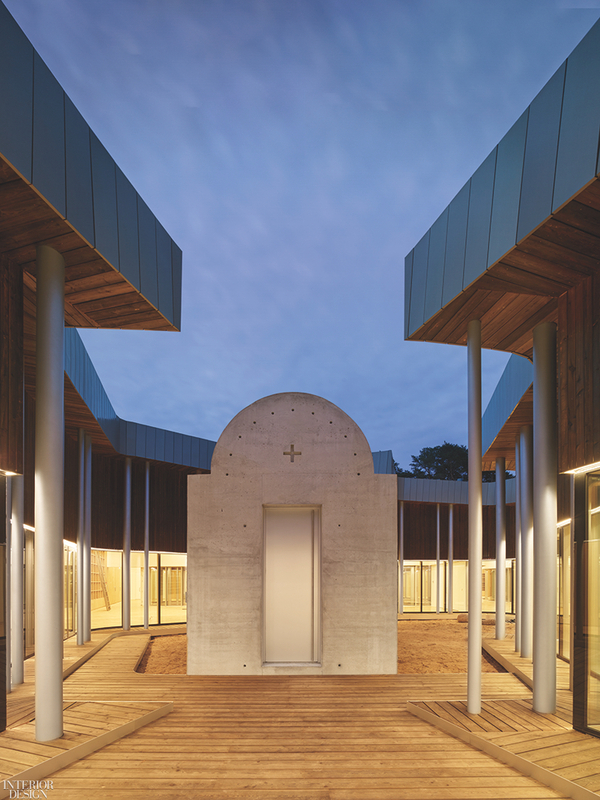 Inside, it’s monastically simple, appointed with a single pendant fixture and a few of the Pärts’ personal artifacts. The viewing tower was of particular importance to Arvo Pärt. He wanted to be able to climb above the tree line to capture vistas of the Baltic Sea, which provides inspiration for his compositions. Nieto Sobejano responded with a 100-foot-tall structure in galvanized steel. Inside, a steel spiral stair winds all the way upward and out to a viewing platform. (There’s also an elevator.) Even though he’s an octogenarian, Pärt clearly has a lot of music left in him. The library built-ins are oak-veneered. Photography by Roland Halbe. Zinc panels compose the roof. Photography by Roland Halbe. The pentagon shape was chosen for skylights to reference both nature and music. Photography by Roland Halbe. The concrete chapel stands in the main building’s courtyard. Photography by Roland Halbe. 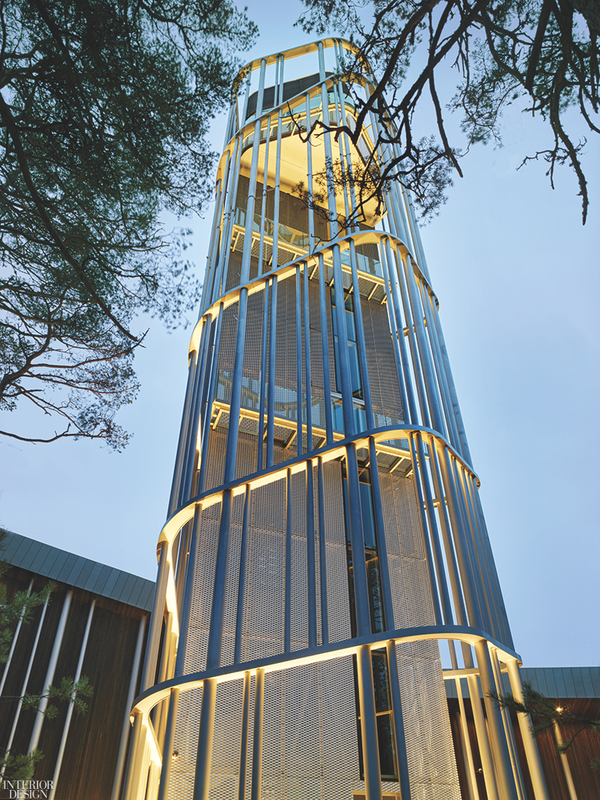 Galvanized steel forms the 100-foot-tall viewing tower. Photography by Roland Halbe. 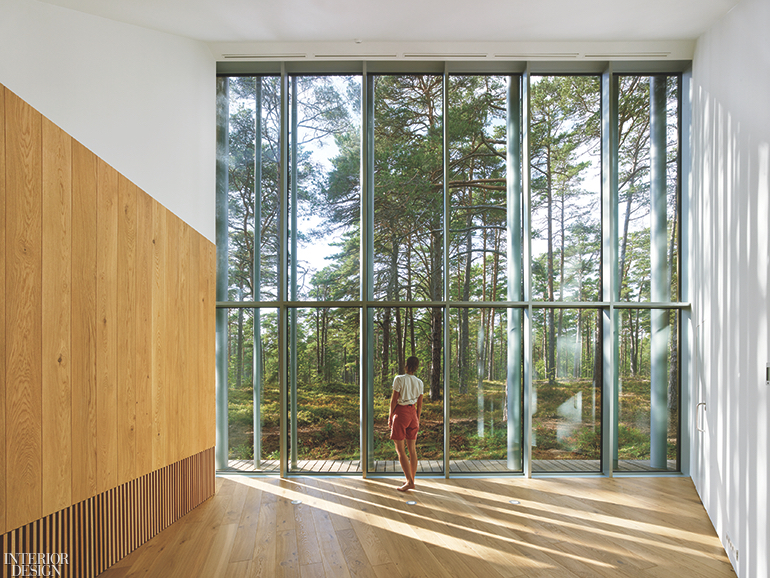 Floor-to-ceiling windows emphasize the connection of composer Arvo Pärt’s music to nature. Photography by Roland Halbe. The auditorium seats 150 people. Photography by Roland Halbe. 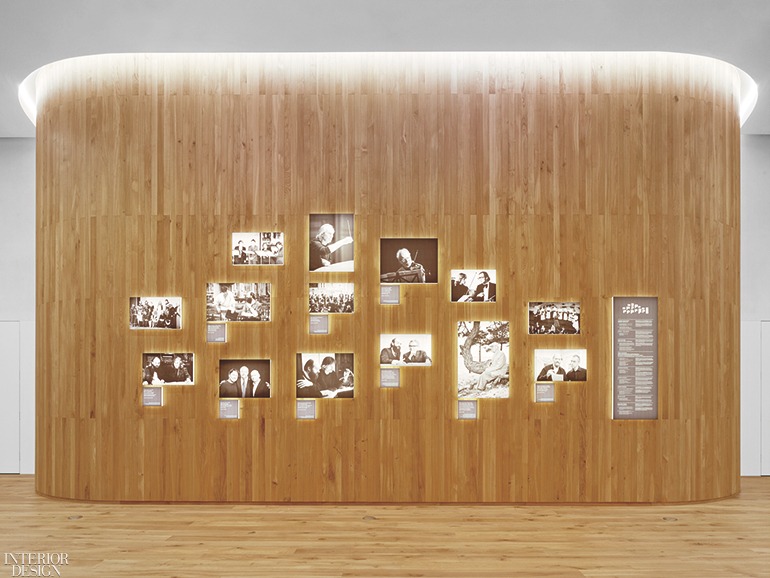 Photographs highlighting Pärt’s six-decade career are permanently on view in the gallery. Photography by Roland Halbe. 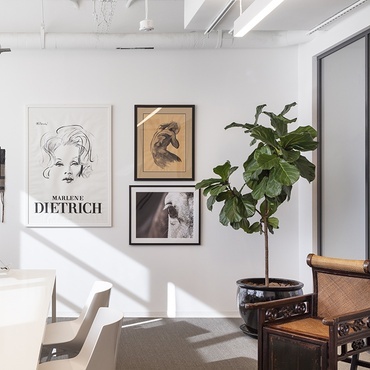 The work­room is centered around a custom oak-veneered table. Photography by Roland Halbe. The site occupies 9 acres. Photography by Roland Halbe. 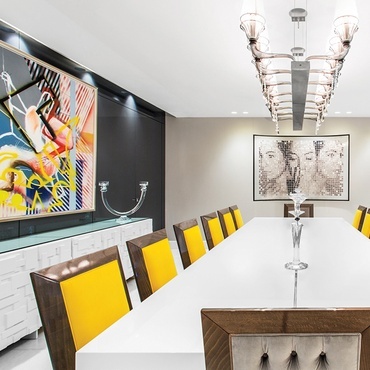 Project Team: Alexandra Sobral; Simone Lorenzon; Covadonga Blasco; Pablo Gómez; Víctor Mascato; Michele Versaci; Adrián Rodríguez; Alejandro Klim­Owitz; Vanesa Manrique; Natalia Bello: Nieto Sobejano Arquitectos. Arhitektuuribüroo Luhse & Tuhal: Architect of Record. Ignacio Valero: Lighting Consultant. Inseneribüroo Pike: Structural Engineer. Hevac: MEP. Feliton: HVAC. Retlar: Woodwork. Terasteenus: Concrete Work. Eksklusiivehitus; Rosin Ehitus: Roof Contractors. Ehitustrust: General Contractor. Interested in more? 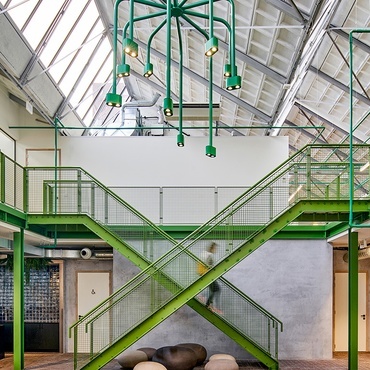 Here are 10 recent European design projects.